Most brides and grooms look for the perfect wedding venue that suits their personality and wedding style, and finding the right wedding venue is always the top task on every couple's list. Finding your wedding venue can be stressful and can take a lot of time, this is why we have a list for you of the Top Wedding Venues in Muscat if you're getting married in Oman's capital. Most venues in Oman also have luxurious spas to help the bride relax and pamper herself before the wedding day. For a romantic and dreamy wedding, this wedding venue is perfect! Al Bustan Palace offers you and your groom a fancy and romantic dinner after your wedding and 2 free nights in a luxurious suite with a delicious breakfast. It also offers a beautiful 3 teir wedding cake decorated to suit your wedding theme. For a unique entrance, the hotel offers a fancy red carpet to welcome your guests, as well as a lit dance floor. The Shangri La Resort is one of the most luxurious hotels in Oman. 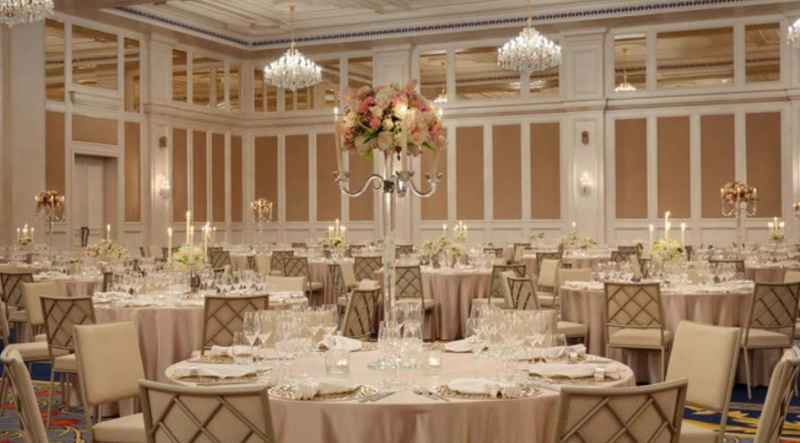 The hotel offers luxurious ballrooms with crystal chandeliers that add a touch of richness to the venue. It also offers a beautiful outdoor wedding venue with a stunning sea view. The food and bevarages are created by some of the most talented chefs in the Middle East, who will create a special menu just for your wedding. The team at the Grand Hyatt in Muscat make sure to pay attention to every detail of your wedding to make it a unique night. 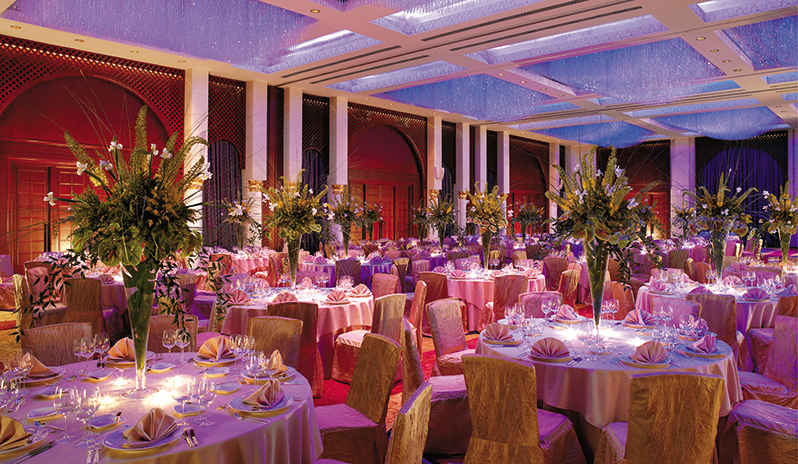 The ballroom is located on the ground floor, with a private entrance and parking, and takes up to 500 guests. The ballroom can be devided into 3 smaller ballrooms depending on the wedding guest number. The ceiling is decorated with crystal chandeliers and 3 screens, with the latest sound and light systems. 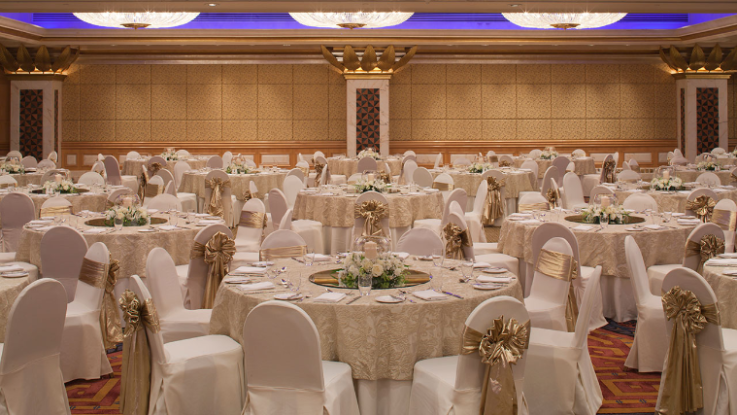 The ballroom of the InterContinental Muscat takes up to 500 wedding guests with round tables. 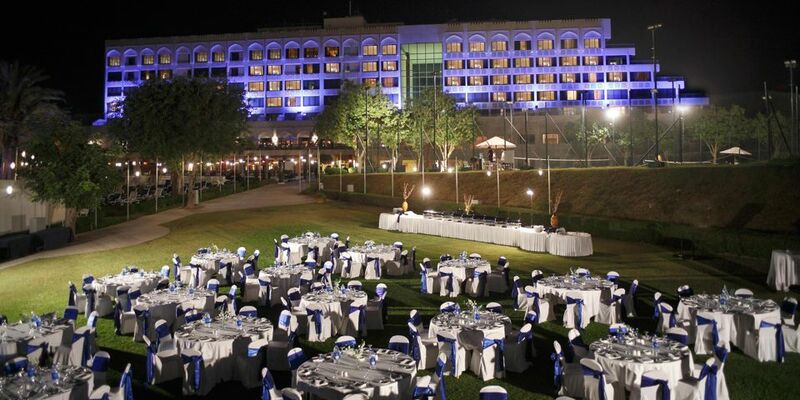 Other than the food and bevarages, the hotel also offers wedding planning services. The Crowne Plaza Hotel in Muscat is near the ocean and is far away from city traffic.You can have your wedding outdoors in their beautiful garden or choose the indoor ballroom which is also a great option in colder weather. The Chedi Muscat is one of the most luxurious hotels in Oman, it is one of the most perfect outdoor wedding venues that have a beach and ocean view. The hotel also has another outdoor wedding venue on the pool. 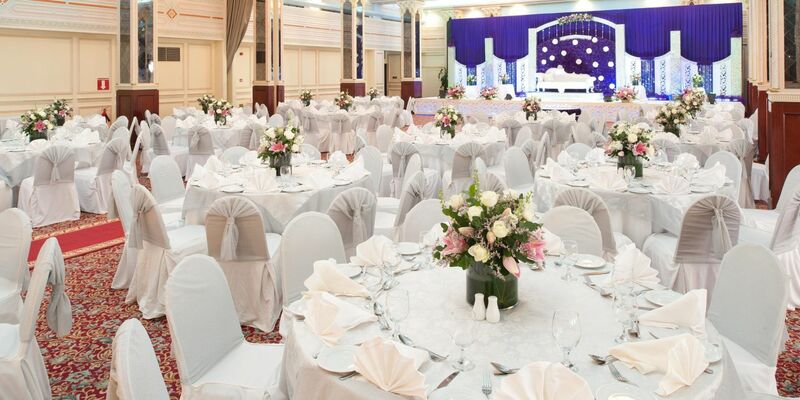 As for indoor wedding venues, the hotel's ballroom is perfect for small weddings, and the ballroom has an asian vibe and decor. The Chedi are known for their deliciou food, and can offer you a special menu of seafood, middle eastern food, indian, or asian, depending on the couple's choice.